Read and comment on this story from the May 12 issue of The Nation that says the war in Iraq cost around 135 American lives. But thousands of Iraqis are dead and thousands more wounded. The nation is a shambles. 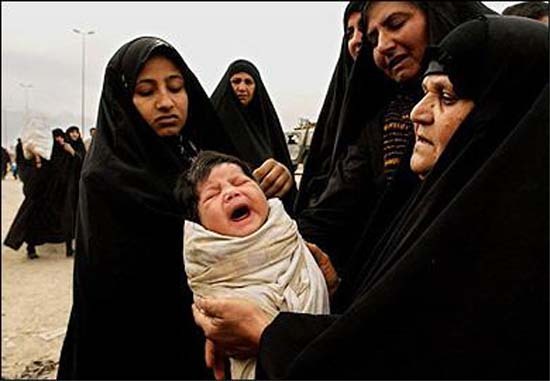 Its hospitals are understaffed, medicines are in short supply or nonexistent, thousands of children are suffering the consequences of twelve years of sanctions, the landscape is littered with unexploded bombs and looting has emptied the nation's larder. The telephone call to the headquarters of InterAction--the political arm for more than 160 US-based nongovernmental relief organizations--on the early afternoon of April 17 was not unexpected. InterAction had been told just days before that George W. Bush had made a final decision on which government agency would be coordinating US relief work and distribution of federal aid funds in Iraq. The debate over that question had caused months of consternation among InterAction's "big five" (CARE, MERCY CORPS, Save the Children, the International Rescue Committee and World Vision), which had strenuously argued that the State Department, not the Pentagon, be charged with overseeing the Iraq relief effort. On April 3, in a last-ditch attempt to influence Bush, InterAction's members issued a statement saying that the Administration's efforts to "marginalize the State Department and force nongovernmental organizations to operate under DoD jurisdiction complicates our ability to help the Iraqi people and multiplies the dangers faced by relief workers in the field." According to InterAction officials, the April 3 statement drew "a line in the sand": If the President wanted to make the Pentagon the final arbiter of NGO initiatives, InterActions' members would be forced to withdraw from the US-led relief effort. Their reasons were clear--US military coordination of relief efforts would undermine the impartiality and neutrality of international organizations, placing their workers under suspicion of being an arm of the military. It could cost lives. Aid workers were already under pressure to provide relief in a society that was not yet adequately policed. In early April a relief worker in Afghanistan was murdered. So the big five were adamant. Anything that undermined their independence would be rejected. Then came the April 17 phone call. "We were told that the government disaster and response teams would answer to the US military and not to the State Department," an InterAction staffer says,"and that was that." The big five have to decide whether they should work under the military. The NGOs decided to acquiesce in US military coordination, take US money and, in the words of this same InterAction official, "just hope for the best." That decision will have enormous consequences--it marks the first time in US history that the military has intervened in civilian relief efforts. "This was a coup, a military coup against civilian control over civilian operations, "a leading advocate for a Washington, DC-based human rights organization says. "It is a disastrous decision. It sets a precedent that no one wants to set. These guys (the NGOs) got rolled, and they know it." Joel Charney, a vice president of Refugees International, agrees. "We don't have to worry about that, because we don't take US funding, "he says of his organization. "But the big US NGOs with international roots are in a bit of a spot. What this means is that General (Jay) Garner (who heads the Pentagon's Iraq Office of Reconstruction and Humanitarian Assistance) can decide who gets food and who doesn't. Instead of an objective assesment , which is best done by the State Department or the United Nations, we have a person in charge who has a political past. Even if he is objective, there will inevitably be questions. The NGO community is in real danger of being militarized." Officials in the big five admit that the Bush Administration's decision to put the Pentagon in charge of international relief efforts causes problems. But faced with an imminent humanitarian crisis in Iraq, each organization has chosen to emphasize its continued adherence to neutrality and impartiality and hopes that, as one of them said, "the US realizes that the decision they have made has to be reversed." As another big-five official notes, "We had a choice of providing relief under the conditions set for us or letting people get by on their own hook. We decided that our first responsibility was to help people. "Charney is skeptical: "A lot of these organizations have international offices that will disagree with the heads of the US divisions. It is one thing to take money from the European Union: it is another thing to operate under the control of a European military force. "Peter Gubser, the Washington head of American Near East Refugee Aid says, "You can't go into a country wearing the badge of the US military or any other similar force. It is a bad precedent." Andy Pugh, the director for policy and advocacy for CARE, disagrees. "We have been upfront and transparent, and we continue to be concerned," he says. "We have always said and we continue to maintain that relief efforts should be coordinated by the US Agency for International Development. And we have been clear about maintaining our principle of independence and impartiality. We are writing programs that will test the Pentagon's good-faith statements that confirm these principles. How has this been working so far? "We are hearing the right messages," Pugh maintains. "But the critics are right about one thing: This is a huge discussion right now in CARE and other humanitarian organizations. We talk and debate about this every day. We are optimistic. But there are tripwires." The tripwires will be reached very soon. Within weeks relief organizations will be handing over their assessments of who should get aid and why--and they will develop implementation programs to make certain that happens. If any of these are vetoed by Garner or his aides, one big-five official claims, "There will be a big debate about whether we can continue to work with the military. If they have veto power, then we may have to come home." Bush's decision that the Pentagon would coordinate Iraqi relief efforts is another chapter in the ongoing debate within the Administration over who runs foreign policy. "Colin Powell argued long and hard about this with Rumsfeld," a senior leader of a US relief operation notes. "He lost the battle--but at least the battle was fought." However, according to a former US commander who oversaw security efforts in Bosnia and Kosovo, where State was in charge of relief efforts, the President's decision was "foreordained." He describes the Bosnia and Kosovo relief initiatives as "complete disasters. There was no coordinating body, no one in charge saying, 'Forget about rehabilitation for now, we need water first.' We had relief supplies we didn't need. We had people building houses for people with no food. There was no prioritization. You need someone on the ground who's in charge. And because there wasn't anyone, the people of Bosnia and Kosovo are still suffering--and all of this gaggle of NGOs are now gone." NGO officials agree with this assessment, but only partially. "It is true that NGOs go where the action is, but that's what we're supposed to do," Wendy Batson, the head of humanitarian programs for the Vietnam Veterans of America Foundation, points out. "But to just sit back and assume that relief organizations will take orders from the US military is a bit naive. We know a lot more about how to provide relief services than anyone in uniform. I can tell you this, long after the military is gone from Iraq international relief organizations will still be on the ground trying to resolve the problems that it caused." It is not only the NGO community that questions the military's new postwar responsibilities. Privately, but firmly, some military officers are beginning to speak out. "The military has not changed its mind about not getting involved in nation-building, it just looks that way," a senior Pentagon colonel notes bitterly "this is all Rumsfeld. If he says the UN should be in charge of this, it makes them relevant. If he says the State Department should do this, it makes them relevant that is just too much for him to swallow." The war in Iraq cost around 135 American lives. But thousands of Iraqis are dead and thousands more wounded. The nation is a shambles. Its hospitals are understaffed, medicines are in short supply or nonexistent, thousands of children are suffering the consequences of twelve years of sanctions, the landscape is littered with unexploded bombs and looting has emptied the nation's larder. "We have a long way to go, years to go," says Joel Charny. "This thing is not nearly over. The final victory will depend not just on whether we can appeal to the hearts and minds of the Iraqi people but whether we can fill their stomachs. And that battle is just getting under way." The May 12th issue of The Nation ("Rummy Invades Iraq Aid") reports that President Bush has decided that NGOs, doing humanitarian relief work in Iraq, will be supervised by the Pentagon and not the State Department. Mark Perry, (author of this article and also of the book; Four Stars: The Inside Story of the Forty-Year Battle Between the Joint Chiefs of Staff and America's Civilian Leaders ) quotes one InterAction official as saying "That decision will have enormous consequences--it marks the first time in US history that the military has intervened in civilian relief efforts..."
Perry's article should be considered mandatory reading for anyone interested in how military victory in Iraq may impact the way American civilians work overseas. The concerns recounted in Perry's article are very familiar to Peace Corps Volunteers. People served need to see relief workers as fair and impartial. The safety of such workers may depend on protecting the independence and integrity of the humanitarian mission. Perry also describes the problems with relief efforts in Bosnia and Kosovo which may have precipitated the President's decision. The ongoing fight over strategy between Secretary of Defense Rumsfeld and Secretary of State Powell continues to influence foreign policy decisions, according to the article. This decision of Bush, in favor of Rumsfeld, is important news for RPCVs. Many already work for US based humanitarian organizations or may be seeking such employment. Many will be recruited by such agencies because of the unique skills and experience RPCVs possess. The United States Peace Corps has no plans to send Volunteers into Iraq and current legislation pending in Congress reaffirms the independence of the agency. However, this should be a "Heads Up" for all of us. The times are changing and RPCVs need to pay attention to what is happening with NGO's. 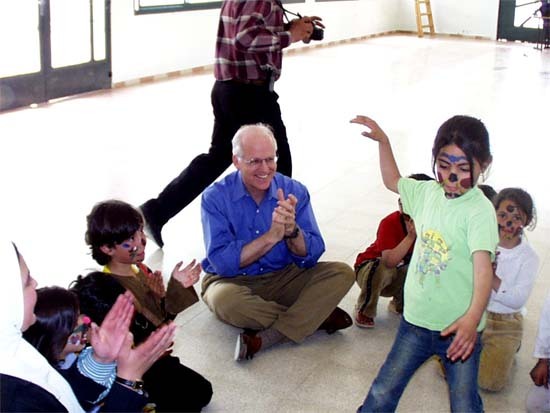 Caption: RCPV Congressman Chris Shays visiting a school on the West Bank. during his recent trip to the Middle East where he was the first Congressman to visit Iraq. Read and comment on this story from NBC30 that RPCV Congressman Chris Shays says that that the military victory there could be "marred" if rebuilding that country is not made a top priority. He recently returned from a trip abroad to Qatar, Kuwait, Jordan, Israel, Gaza and the West Bank. During his trip Shays was the first Congressman to visit Iraq, crossing the border from Kuwait against the wishes of the Army and State Department. "We now have to win the peace in Iraq and that's going to be very difficult," Shays said. "If we fail to bring some stability to that area, then the whole effort will have been marred." NORWALK, Conn. -- U.S. Rep. Christopher Shays, the first member of Congress to visit war-torn Iraq, said that the military victory there could be "marred" if rebuilding that country is not made a top priority. Shays, R-Conn., bucked protests from the U.S. military and the State Department and traveled into Iraq on April 16 with a convoy of aid workers from the Westport-based charity Save the Children. He defended his right to see the situation firsthand, and said he was struck by the level of poverty, noting that there was no running water, few buildings and many children in the streets. "We now have to win the peace in Iraq and that's going to be very difficult," Shays said. "If we fail to bring some stability to that area, then the whole effort will have been marred." Nongovernment organizations such as Save the Children play a vital role in helping Iraq rebuild, Shays said. He complained during his trip that humanitarian aid wasn't getting to the Iraqi people fast enough. "Rebuilding Iraq is huge and you need to get the NGO's in there," Shays said. "I just think we need to be there and moving more quickly and more open arms to get the NGOs all throughout Iraq. We don't have a lot of time. The Iraqi people need to see they're in charge pretty soon." He praised the military for its success in Iraq and pointed out the important role women in the military played in winning the war. He also predicted U.S. forces will find evidence of weapons of mass destruction, but said it may take time. Following his journey into Iraq, Shays joined a congressional delegation that met with Palestinian leader Yasser Arafat and Palestinian prime minister, Mahmoud Abbas. It was the first high-level meeting between U.S. officials and Arafat since President Bush effectively boycotted him in June. The talks, however, were not sanctioned by the State Department. Shays said the group also met with other Palestinians, including doctors, lawyers and students. "Almost every school had a blown out building next to it," Shays said. Wherever he went in the region, Arabs brought up the conditions that Palestinians live in and urged the United States to be fair in efforts to win a peace agreement between Israelis and Palestinians, Shays said. "We have to see major success in our effort between Israel and Palestine," Shays said. Shays said that he was "somewhat disheartened" to hear reports from independent observers of abuses by Jewish settlers in Hebron. He also questioned Israeli security measures in Ramallah and suggested Israel was engaged in collective punishment. He described himself as a strong supporter of Israel and said that he met with Palestinians after some of his constituents asked if he had spent much time with Palestinians and he said he had not.